Associated Comments - 2000 : Standard Motor Products SMP Fd-508. Country of Origin (Primary) : CN. Harmonized Tariff Code (HTS) : 8511300080. Harmonized Tariff Code (Schedule B) : 8511300080. Life Cycle Status Code : 2. Life Cycle Status Description : Available to Order. Maximum Cases per Pallet Layer : 6. NAFTA Preference Criterion Code : B. National Popularity Description : Top 60% of Product Group Sales Value. 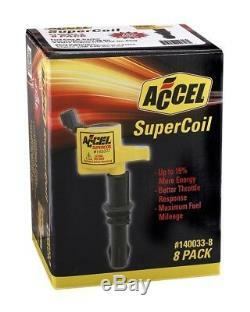 Product Description - Extended 240 : ACCEL FORD 3 VLV MTR COIL KIT. Product Description - Long - 80 : Ignition/Electrical. The engine types may include 4.6L 281Cu. V8 FLEX SOHC Naturally Aspirated, 4.6L 281Cu. V8 GAS SOHC Naturally Aspirated, 5.4L 330Cu. V8 BI-FUEL SOHC Naturally Aspirated, 5.4L 330Cu. V8 CNG SOHC Naturally Aspirated, 5.4L 330Cu. V8 FLEX SOHC Naturally Aspirated, 5.4L 330Cu. V8 GAS SOHC Naturally Aspirated. This part fits vehicles made in the following years 2004, 2005, 2006, 2007, 2008, 2009. This item may interchange to the following part numbers from other brands. Online tracking may take up to 48 hours to update online. No warranties expressed or applied. Installation by qualified personnel only. Portions of the part information on this page have been provided by WHI Solutions, Inc. 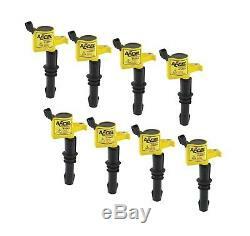 The item "Ignition Coil Set-Super Coil Set ACCEL 140033-8" is in sale since Thursday, March 01, 2018. This item is in the category "eBay Motors\Parts & Accessories\Car & Truck Parts\Ignition Systems\Coils, Modules & Pick-Ups". The seller is "just-european" and is located in Miami, Florida.